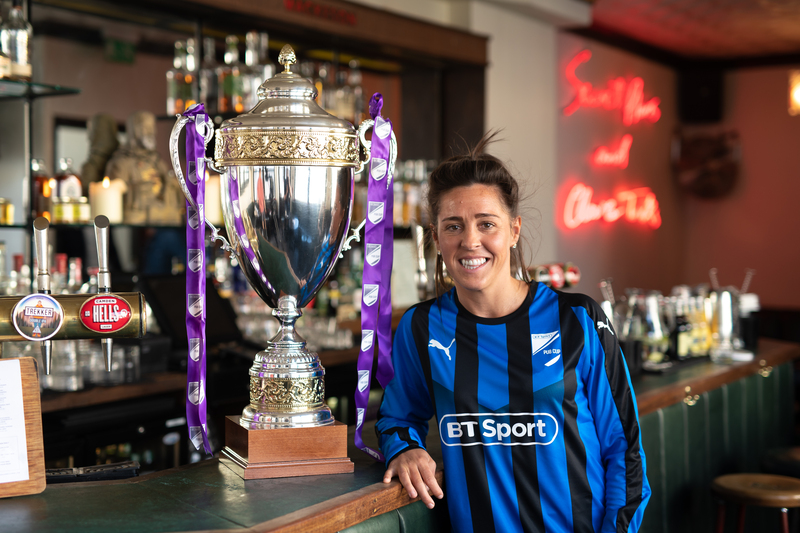 The BT Sport Pub Cup returns this year with over 190 places open to men’s and women’s pub teams across the country. Beginning on the 8th May, teams will compete in 12 regional qualifiers in iconic stadia, such as Anfield, Selhurst Park and the Stadium of Light. The winning teams will then proceed to the semi-finals at Manchester City’s Academy Stadium before playing in the Final at St. James’ Park on 4th June. This year, Rachel Brown-Finnis and Fara Williams will be the managers for the two women’s teams that make it to the Final. We caught up with both England legends who were speaking at the launch of this year’s BT Sport Pub Cup. 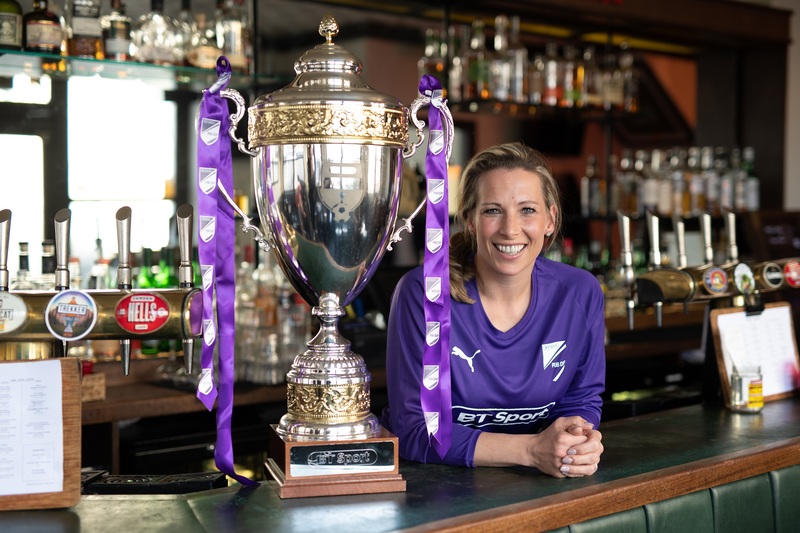 What is it about the BT Sport Pub Cup that made you want to be involved? RBF: I think it’s one of the only competitions that you can get involved in even if you’ve never kicked a ball before but you’re a big fan of football. I mean this is an opportunity for women who go and watch football at the grounds, but maybe who have not played football before or have been disengaged from the sport for a number of years. It breaks down barriers – the kits are provided; the competition takes place all around the country; and it’s just a matter of contacting your pub to get a team together. This is a chance to go out there at some of the iconic pitches in this country, pull on a football shirt and run about on the green grass, doing what you see week in, week out. FW: I think it’s a fantastic opportunity for myself and Rachel to share our experiences as players with women at a grassroots level. We have had plenty of chances to work with kids but now we have an opportunity to share them with the older generation of female players that are out there. It’s great, both for us and the women that have entered the competition. As a manager this year, what is your role in the competition? RBF: Myself and Fara will be managing a team each for the final I believe. Hopefully, we will be a visible role model for the women taking part. I know having finished playing and having had children, I juggle a lot of different things, so in a different capacity, I may be seen as a role model that respect. How important is it for opportunities, such as this tournament, to now be available to women? FW: I think the growth of women’s football in the last few years has been fantastic and, because of that, we’re starting to see the rewards a little more at grassroots level at all age groups. It’s brilliant that BT Sport has opened this competition up to women now and given them an equal opportunity to male fans, with the chance to go and play at some fantastic stadiums. The game has changed a lot over the last few years both on and off the pitch. What for you are the biggest highlights and what do you think needs more work? RBF: I think the highlights are the successes and the chances to really shine. The Olympics were a real stand out for me as far as women’s football being put on the map. With 70-odd thousand at Wembley against Brazil, both from a personal point of view and in the perspective of the growth of the game, I think that was a landmark moment. The inception of the FAWSL has been critical – we have always needed to grow the domestic game to complement the growth of the international game. The introduction of it being fully professional this year was another landmark moment. But what needs to continue to grow and change is how we engage football fans, not just women’s football fans but all football fans, and drive the number of people that come to games up. Just this weekend you’ve 39,000 at Juventus – we’ve seen that a number of times now. We’re supposed to be the leading light in the standard of women’s football, and we are in a lot of respects, but there are obviously still lessons that we need to learn to really push the game forward. FW: We’ve seen it with Phil Neville coming into the senior England setup, I think there’s a different dynamic to the women’s game. With him coming over from the men’s game, it brings a different insight into the sport. The FA with their investment and how they really want to drive the game forward – we’ve seen it recently with the Barclays investment to try and grow the game even more. And we now have younger players that are skilled and are able to be developed in an environment where they are able to improve. Fara, you’ve have had a glittering career so far on the field. From the outside, it’s hard to pick one moment but what would you say has been the best moment so far? FW: Domestically, winning the league at Liverpool was a highlight for me. As a young girl, I dreamed of winning a league title, which I was able to do at Liverpool, and winning an FA Cup at Wembley. I never thought playing at Wembley would ever be possible so the fact that I did it at Arsenal is a moment that stands out in my mind. As an international, winning the bronze medal (at the 2015 World Cup) and beating the Germans in the 3rd Place Play-Off was fantastic. Rachel, after playing you have been making the shift towards working in the media. How have you found it? RBF: It’s brilliant. I really enjoy it, both the ups and the downs. I’m not the first but being in an emerging group, you’re always going to get some kind of backlash from people questioning how you should consume your football. But that’s changing. There have been a lot of people before me who have been a part of that movement and it’s just about normalising it, it’s as simple as that. The more you hear female voices, the more you see female faces, the more written articles you read – whatever platform of media it is – the more visibility there is will hopefully firstly encourage young up-and-coming females to get involved and secondly it will become accepted. Like so many things, the first rustlings of change upset a few people and now we’ve got social media, obviously people can shout about it and tweet about it. Moving on from that, it’s looking positive for the future. Personally, I thoroughly enjoy it. I just try to give an honest opinion; it’s never anything personal, and I just sort of say it as I see it. And I’m enjoying having a goalkeeper voice as well because it doesn’t happen that often. There has been a lot of good news around women’s game this last few months – big attendances in Europe, Barclays investment in the FAWSL – all seem to be leading up to the World Cup this summer. How excited are you for the tournament and who are your favourites to win? RBF: I am super excited for the tournament. Not just because England are my favourites to win but because they’re in pretty good form. I really liked in the last tournament how they changed things up tactically and they proved that they can soak up pressure and ride games out. They looked really clever in that respect and they still have a good couple of experienced players, like Millie Bright and Jill Scott, to come back in to that squad. It’s a very positive time and it seems to be a part in that shift in the perception of what England – both across the men’s, the women’s and the youth teams – are about. FW: I’m really excited for the tournament. I think England have a really good chance. We have some really good youth players that have come through under Phil Neville and had the opportunity to play some international games. I think France will be difficult. They have always been a team in previous tournaments that have failed to achieve what they can. I think the fact that they’re hosting it will give them a massive advantage, like the Dutch did when they won the Euros. The BT Sport Pub Cup is free to enter and every team that enters will receive a full Puma team kit. To enter your team in the BT Sport Pub Cup go to www.btsportbusiness.com/pubcup. Entries close on Sunday 31st March. Tagged bt sport, bt sport pub cup, football, grassroots football, women's football.